Pam,I love your journal pages. I wish I could take a class from you. What size journal do you use? Awesome page–I’ve been doing some ‘advertising’ for you around town..lol..some peeps have asked me where to go for classes, so I’ve highly recommended you :)Take a breather today, things are moving at lightening pace for you, but don’t let it burn you out before you can truly enjoy it all! 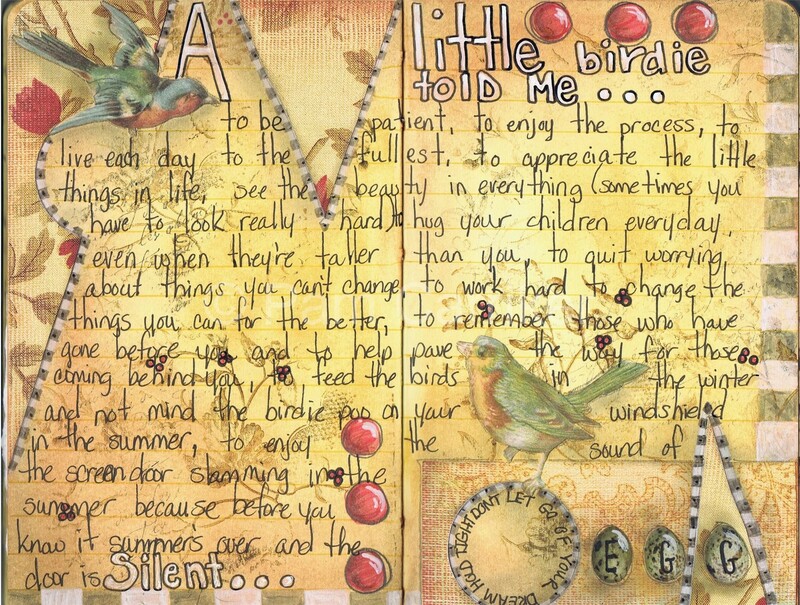 what a gorgeous journal page…..wise words too. Oh, I really adore this two page spread Pam!Abd btw everything on your blogs looks fine on my end. Pam tht is one of the prettiest journal pages I have ever seen… I just love it! Wonderful message on a great page! I loved the art and what you said on this page it is now in my journal the words anyway. To remind me to slow down and enjoy life. I love watching your online viedos. And hope to take one of you classes soon. Thanks for the shot in the arm this made my day start better!!! I LOVE this page!! And your journaling is wonderful! This is awesome. I love popping over and seeing your journal pages and artwork. I just love your journal pages! I particpated in your online class and have enjoyed it a lot. I’m afraid I haven’t finished the lessons yet and still get intimidated with the pages. Could be because I decided to do the whole book at once. Family moto is if it’s worth doing it’s worth overdoing. Takes longer when you have to keep stepping away to let things percolate but I’m enjoying playing with the techniques.